Clusters of tightly formed buds burst open to display miniature clouds of double and semi-double, rose-bud like flowers in a scarlet red. 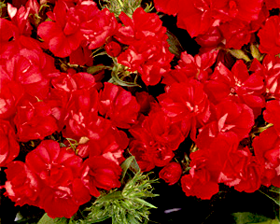 Specifically bred for garden performance, the well-branched plants form a compact mound of clean, fresh blooms over a long period in both hot and wet conditions - often not the case with other Phlox. Germinate at 18-20C on the surface of a good free draining, damp seed compost. Apply a layer of vermiculite, 1.5mm deep. Place in a propagator or seal container inside a polythene bag and cover to exclude light until after germination which usually takes 10-21 days. Phlox can also be sown outdoors in spring where it is to flower, 1.5mm deep.